You may or may not know that I suffer with arthritis and have to put up with various aches and pains most of the time. I've been suffering with a lot of neck pain of late, the last year or so to be honest with you and at the weekend thought it was high time I got myself a new pillow. Mine was literally as flat as a pancake! It certainly did not look like any of these! I persuaded Mr C to come with me to M&S on Saturday with the intention of getting our old faithful pillows that would last a good few months. I was having a nose around the clothes and smellies as you do and Nick said he would see me in homewares! When I got there I found him in bed! Yep he was flat out, feet up, having a good old rest on a show bed. Mmmm...shopping is hard going I suppose. Anyway, he had laid his head on a lovely pillow, not just an ordinary pillow but a memory foam one. Now I've tried one of these in the past (from Ikea). It was one of those really hard, moulded ones with no flexibility whatsoever. 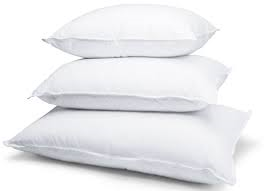 I like to hug my pillow at night but this was like sleeping on a piece of concrete. Out it went. However, Mr C was very persistent with this one, insisting I lie down on the bed and try it, despite it costing more than three times the price of my normal pillow. In the end I gave in. Oooh, errrrr, it was very comfortable. Nothing like the lump of concrete I bought before. 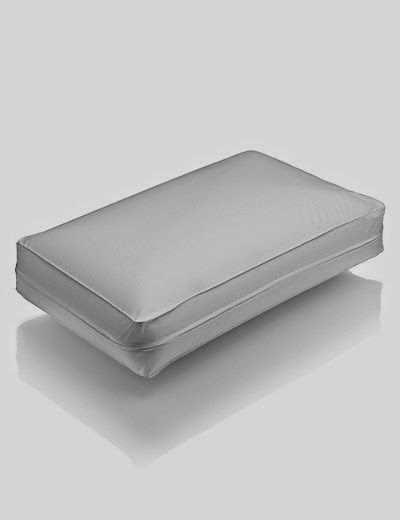 This was a 'medium' support memory foam pillow and it actually had a bit of flexibility with it. SOLD. I'll be honest I did sway back and forth a bit between the cost of my old faithful and this more expensive one, but Nick said it was worth a try and hey, if I didn't get along with he'd have it, no problem! This is my new one. I couldn't wait to try it out Saturday night. So, I've slept with it now for 2 nights. I thought I'd just slip into a having a great nights sleep, unfortunately not, to be honest it's took a little getting used to, only a little, but then I suppose that's only to be expected. When you put your head on this pillow it just sinks deeply into it and is cushioned all round. My neck feels so supported and comfortable, my body feels aligned and I lie there wondering how I ever managed for so long with my awful pancake pillow! I know it's early days, I will persevere and I think I will fall in love with it, so sorry Mr C, don't think you'll be getting your hands on it any time soon, you'll have to save up for your own! The only down side is that its so bloody heavy. It weighs a tonne, no joke. I can't even lift it with one hand to re-adjust it, it's definitely a two handed job! I don't have a pancake any more, I have what we now refer to as a 'house brick'. It's funny but a lot of people I speak to don't put much research or time into looking for the right pillow, yet so many of us suffer with neck, shoulder and back pain, why do we not bother? My new pillow is the Soft Moulded Foam Medium Support Pillow from Marks & Spencer at a price of £35. A lot for one pillow I know but I think it will be well worth it! Do you have a memory foam pillow? Did it take some getting used to? I'd love to hear from you.